Minuartia douglasii (Torr. & A. Gray) Mattf. Habit: Annual, simple or often branched from base, 4--30 cm, finely glandular-hairy at least above, green or purple; taproot thread-like. Stem: erect to spreading. Leaf: 5--30 mm, generally 0.3 mm wide, thread-like, becoming curled, flexible, +- evenly spaced; axillary leaves 0. Flower: sepals 2.5--3.7 mm, obtuse to acute, margin not incurved, ribs generally 3; petals 1.7--2.1 × sepals. Seed: 1.3--2 mm; margin thin, wing-like, red-brown. Synonyms: Arenaria douglasii Fenzl ex Torr. & A. Gray; Arenaria douglasii var. emarginata H. Sharsm. Unabridged Note: Variation in presence or absence of petal notch precludes recognition of Arenaria douglasii var. emarginata H. Sharsm. 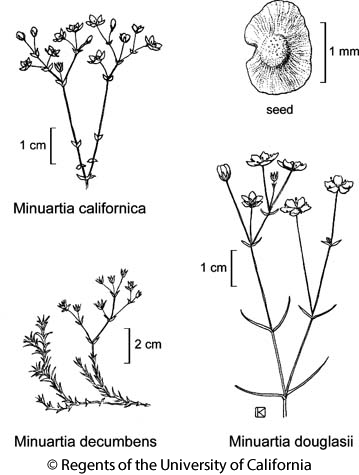 Citation for this treatment: Ronald L. Hartman & Richard K. Rabeler 2012, Minuartia douglasii, in Jepson Flora Project (eds.) Jepson eFlora, http://ucjeps.berkeley.edu/eflora/eflora_display.php?tid=33747, accessed on April 22, 2019. NW, CaR, SNF, c SNH, GV, CW, SW, MP; Markers link to CCH specimen records. Yellow markers indicate records that may provide evidence for eFlora range revision or may have georeferencing or identification issues. Purple markers indicate specimens collected from a garden, greenhouse, or other non-wild location.